Zane Education provides “visual learning – on demand subtitled videos, quizzes, study tools, lesson plans” as well as The Missing Piece – which helps students to learn effectively while improving their reading and literacy skills and helping them to not be left behind. On their frequently asked question area about whether or not the videos contain religious teachings or messages the response is that they do not convey any religious or spiritual beliefs but use videos to support educational facts as outlined in K12 curriculum. We have been using Zane to compliment what we’ve been learning or what the child’s interest is. It does a wonderful job in filling in the gaps or adding to our current history and science curricula. I’ll be continuing to use this website to add another exciting feature to our school days – although mine still prefer I read their lessons to them. My 6 year old especially like the body videos which showed how the nervous system and other systems of our bodies work in a way that was easy for him to understand. The Getting Started and User Guides can be downloaded for free by visiting Zane Education here. I barely scratched the surface in watching these videos as there are over 1,500 videos spanning 400 topics with included lesson plans, quizzes and more. While I am a home educator, Zane Education can be used by families who just want to add a little more education to their child’s learning experience – and since it’s aligned with National and State standards for grades K through 12 – it’ll work for just about any child in public, private, virtual school or home schooled! With the subtitles and closed captioning it can help those who struggle to read, while improving those skills without them realizing it. When I first started out with this, I was very excited, because I was thinking these would be videos like other on demand video sites – but they aren’t. They reminded more of a slide show that I would have been subjected to in the schools I attended, although the sound quality was much better but some videos still appeared to be less modern – which is both a good and bad thing, good because there were no skimpy clothing; bad because most children may not be able to relate to the older style of dress that appears in some videos. This did not bother my 6 and 7 year old however my 10 year old was not as enthused about the videos – I did enjoy learning from them myself even with the sense of nostalgia. 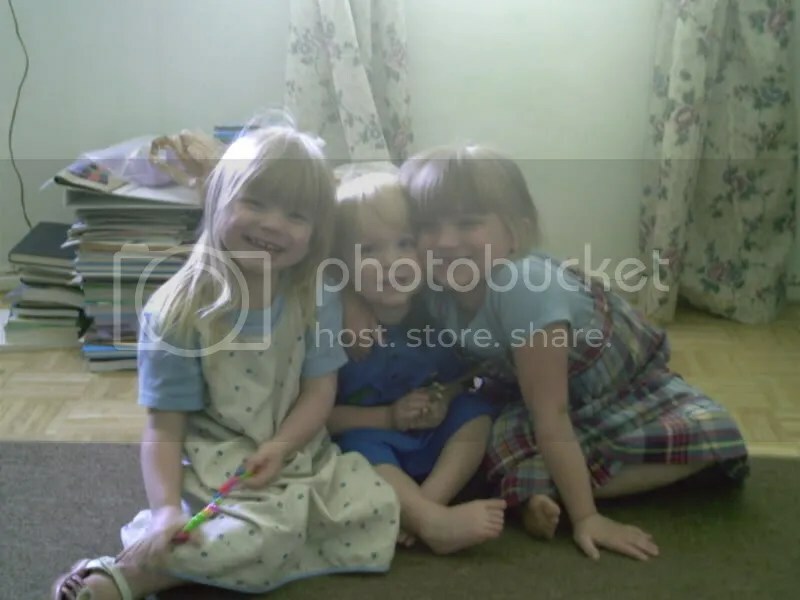 Overall, I liked being able to have videos that are easy to access and available for my children without me having to worry about content as much as I have to with regards to T.V. and I think the quizzes are a good thing but even I struggled with some of the questions because you much pay very good attention to what you are watching and in the body area you have to watch all the videos before you can take the quiz – so if you don’t remember everything you won’t score well. There are downloads of the lesson plans for each video and those can be printed if you desire to do so, along with study helps such as a dictionary, encyclopedia and a thesaurus. Thankfully there are levels for each income level even if the smaller memberships limit they each have something that will work for families who want a little something extra for their students. You can find Zane Education on Facebook. 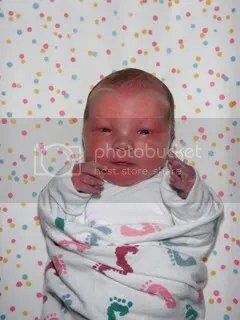 Well today is the day, my little boy is 6, I can’t believe how much he has changed over the last several years. I miss him as a baby but he is such a delight – I laugh when I remember how I thought the u/s tech made a mistake because I had no idea what to do with a boy. 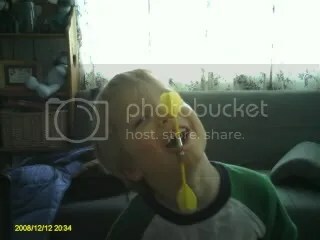 God does have a sense of humor and He definitely knew I could raise a boy. My main fear, potty training, went very easily and well so now if I can get him to adult hood with no concussions or broken bones and have instilled in him a love of God and serving Him then I’ve done my job. The day after my little guy was born! 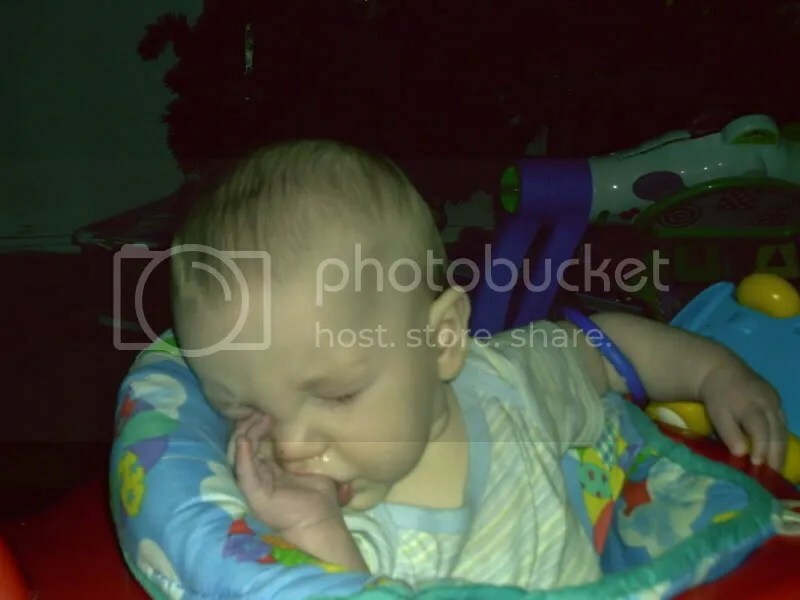 Sleeping in his exersaucer while sucking his thumb. 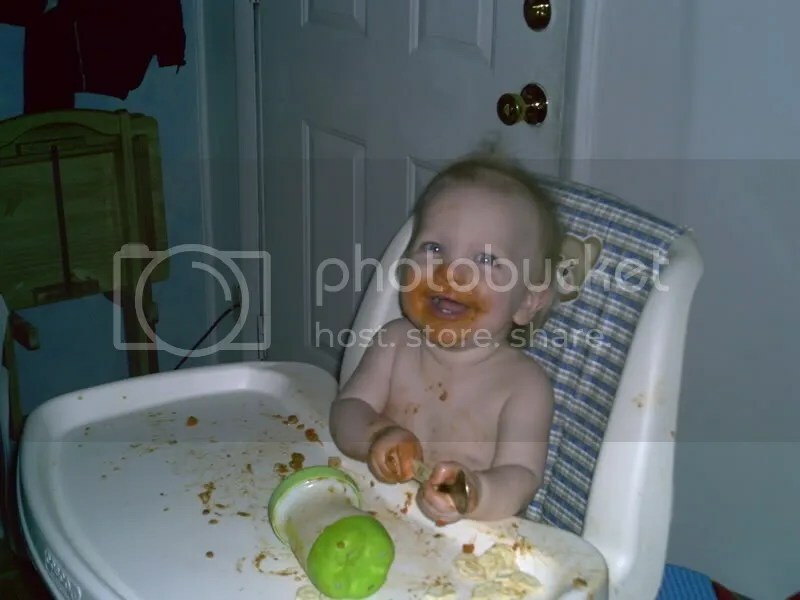 One of his first real food experiences. 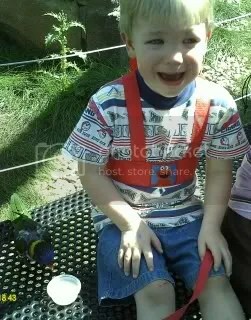 Scared of the lorakeets at the zoo. Christian, now, with his completed moonbrella he made in one of his College for Kids classes this summer. 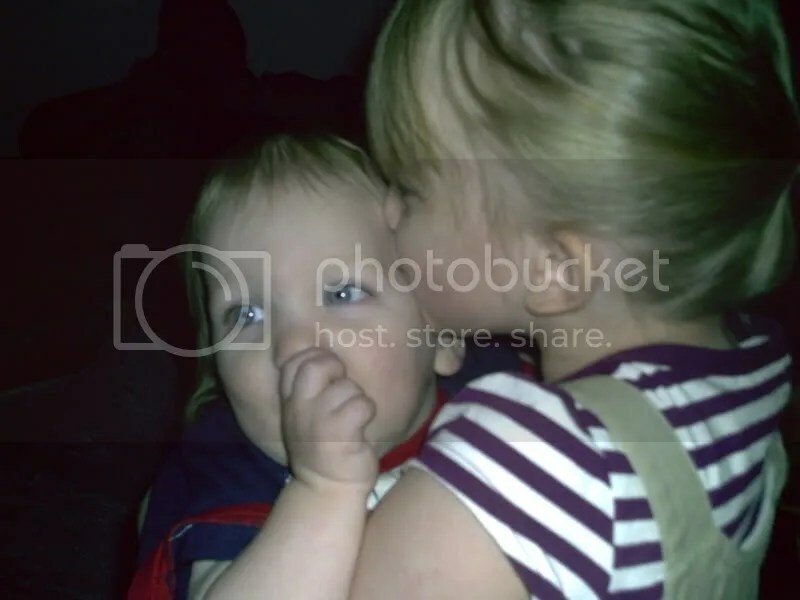 I see snatches of what he is going to become……like yesterday when he took action when Bethanne was scared of a ride at the fair and he went and got her and helped her……. Like when he helps me dry dishes or helps me make dinner……. He’s going to be a great man someday – one that will make me a proud momma and one that will do great things for the Lord. I was very excited to try this computer program from Super Duper Publications because following directions and listening to verbal commands and/or requests is something my younger two children struggle with so I was hoping this would help them in that area. 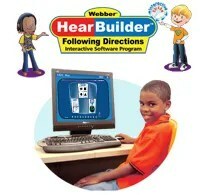 The Webber HearBuilder Following Directions CD ROM is an interactive, evidence based computer program that aims to help children increase their auditory and following direction skills. Aimed at ages 4 to 9, I’d say even an older child might have fun playing this game if they need some help in listening skills – because I had fun playing it, but I won’t tell you my grown-up age in the review! The home edition allows you to add 1 to 4 players which is great if you have multiple children who need help with their listening skills and you have another one who just enjoys computer games. You’ll add a new player simply by typing in the child’s name and when the child goes to play again he’ll be ready to start where he left off the last time. A word of caution here, you may need to check your firewall settings so that the child’s progress will be saved. Then each child can chose a level of play, for my 5 year old I chose the basic, beginner level which began something like “Click on the dog” as they progress the commands get more advanced. Of course this also will depend on what area they are working on such as sequential directions or conditional. My two children who tried it enjoyed this however my 5 year old become a little frustrated because it tends to move slower than he wanted or he didn’t want to wait for the instructions and just began clicking on whatever he felt like. I ended up sitting with him to help him with his patience and make him wait for the instructions. My 8 year old did fine on her own but she tried to hurry the game along as well when it wasn’t going quick enough for her, but she was more willing to wait for the directions to be given. I really enjoyed the game and even found myself getting excited over my next tool, I guess I’m a bigger child than I thought, this was a great way to have my children practice their listening skills and I hope to continue and see more improvement as they each move through the other levels. If tabloid newspapers had existed during the first century, Jesus would have featured constantly in the headlines—his name was unequivocally linked with scandal of one kind or another. Details of his life were recorded by both his friends and his enemies—historical records that are invaluable to us today. They provide insights into Jesus’ life and teaching, which have been obscured by the centuries and tell us what his contemporaries really thought. In examining these records, David Instone-Brewer examines 30 areas of ethical debate—in each context Jesus offered insights that would have left his contemporaries agape. 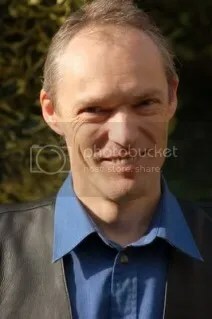 Instone-Brewer addresses Jesus’ parentage and accusations of his alcohol abuse and fraudulent miracles; the dubious status of his followers (poorly educated, ex-prostitutes and the certifiably mad); his anti-religious teaching, eternal torment and his thoughts on suicide, execution, singleness, abortion and sexual immorality. I am in the middle of reading this book, will update ASAP. **Disclaimer: I was given a copy of this book from Kregel in exchange for my honest opinion, no other compensation was given. I was doing a lot of running – both of my girls had a dance camp with was 9-2 Monday through Friday which left me and my little guy on our own. I treated him to lunch one day at his favorite place – McDonalds and he enjoyed having my undivided attention. Also helped in getting our 4-H Club’s fair booth put up. Thankfully the weather cooperated and it wasn’t hot and we got it up without me getting sick. Several from our club also worked a two hour shift at the 4-H Ice Cream booth, which proved to be very fun and I think we may do it again next year, the only thing that would make it better is free fair admission for those working the booth that night. I also began my babysitting job – one day a week I’ll go in with my three and watch a friend’s 8 children. I watched them on Saturday for a few hours and it went great. Some of the 4-H clubs that have awesome displays – it makes me want to start earlier next year and really have a streamlined set up process. The girls at their dance class, others in my son’s martial arts class, people at the fair grounds and McDonald’s. I thought this was cute, my son so tired from getting up early took a nap on one end while Sadie took a nap on the other. Many hands and ladies and children helped in making a great booth for our 4-H group. The was 12 fee long, 6 feet deep and 8 feet high. Do you feel lost when your history curriculum has you doing mapping activities with your children? Do you fumble in finding just the right map for every single age you have in your house? Then head over to Knowledge Quest and take a look at their Map Trek map collections, available in hard cover with CD ROM or as e-books for immediate download after purchase and then you can load them to your e-reader or view them on your computer. Knowledge Quest also has free PDF curriculum integration guides which will help you in figuring out how to align your current history curriculum such as Story of the World, Streams of Civilization, Truth Quest and more on a weekly basis. I’ve been using this with our history program as a more easy way to include geography according to what we are studying. If your history doesn’t include geography, no worries, as there are included lesson plans at each of the different time periods such as Ancient World, Medieval World, New World and Modern World. The lesson plans are divided by grade level – level A is grades 1-4, level B is grades 5-8 and level C is 9-12, some levels are combined and that is noted. As of yet, I’ve haven’t followed the lesson plans as I’ve been using this as a go-along with our history curricula but I do plan on integrating some of the lessons to help refresh what we’ve already studied or what my younger students missed before starting ‘official’ school. Terri Johnson, the creator of Map Trek, recommends you do two days of map work (this is good as I know my children get a little frustrated with more than two days), and these lesson plans could easily carry your family through a half to a whole school year depending on your schedule per section. The included CD ROM is a very important part of this collection, the book is the atlas where as the CD has all the lesson plans and glossaries, blank student maps, reproducible teacher maps, world and continent maps, U.S. History and state maps and much, more more. 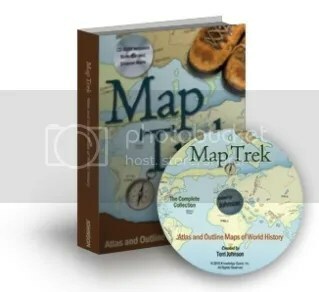 The CD makes all maps accessible and easy to reproduce for your family, no more bending the binding of the book in order to get it copied on your home printer. It does open in an internet browser (Opera for us) but while I was surprised at first it did seem to load faster than if it was just on my hard drive. I didn’t use to enjoy geography but being able to look at map in this beautiful full colored atlas has made me enjoy being able to look at any given map for a time period and seeing just how it looked back then or even today. This is going to be my family’s go-to resource for when we need a historical atlas or a modern atlas and it will last with it’s heavy paper pages and hard covers this is a book that will last years and be a treasured part of our homeschooling adventures for years to come. Do your kids think that clean, folded clothes magically appear in their drawers? Do they roll their eyes when you suggest they clean the bathroom? Do you think it’s your job to pave their road to success? As parents, so often we hover, race in to save, and do everything we can for our kids—unintentionally reinforcing their belief that the world revolves around them. 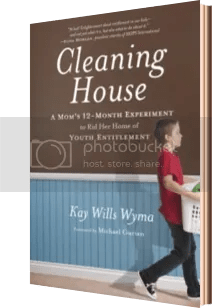 When Kay Wyma realized that an attitude of entitlement had crept into her home, this mother of five got some attitude of her own. Cleaning House is her account of a year-long campaign to introduce her kids to basic life skills. From making beds to grocery shopping to refinishing a deck chair, the Wyma family experienced for themselves the ways meaningful work can transform self-absorption into earned self-confidence and concern for others. I’m not sure where to start about my feelings with this book – I think it has a good premise and I really wanted to like it and really dive into it but I just didn’t find this book as helpful as I was hoping. I like the idea behind it, making sure our children don’t grow up with a sense of entitlement but I found myself thinking, when am I going to hear something besides how her children reacted? It was her experience of an experiment she set up for her family and I thought it was good but I guess I was just looking for something more – something that could tell me how to implement the experiment with my family. Maybe I missed it but I just didn’t get anything that gave me that a-ha moment that I was expecting, yes, it’s good to hear about others experiences but I just didn’t find the book able to keep me engaged. Maybe I’ll come back to it again sometime but at this stage in my life, maybe it’s the busyness of my life at the stages my children are in, I don’t know but it could also be we already do some of the things she did in the book and my children know they aren’t entitled to anything. They don’t know how to clean a bathroom, but then again, neither do I (thankfully my husband does) but regardless of that my children do know that they must pull their load in this house. Please rank my review at the Blogging for Books site. **Disclaimer: I was provided a copy of this book from Blogging For Books through Waterbrook Multnomah in exchange for my honest opinion, no other compensation was given. This Friday, the 20th, our county fair begins and with it means that the 2012 4-H year is unofficially over. I see all the work the children have done, culminate in judging, awards and the fair. There will be an awards banquet – one for our individual club and one for the county, but those are later. I’m so happy that out of 11 children, 4 of which are Cloverbuds and completed a lapbook on insects, 4 of the members completed their project books and went to their respective skill-a-thon or miscellaneous judging. One of our members who has never been in 4-H before was given 3rd place in her project on family history. My oldest who took three projects and because of time issues, completed two, placed 2nd in Cavy (guinea pig) and 1st in her Exploring the Treasures of 4-H. The other member got all A’s at her skillathon and another was given all B’s. Not bad, if I say so myself. Today, my friend and fellow 4-H volunteer and I started getting our fair booth up and tomorrow morning some more moms will come out and help get it finished and put our display boards in. It does look better than last years and my friend made an awesome poster board with our club’s name on it. Pictures will come later after it’s done. I also have to wait as Hannah won’t get her ribbons until next week and my other two don’t have show and tell until next week either. Hannah surrounded with some of her items for the Exploring the Treasures of 4-H project, which she got 1st place in. I took typing in high school and it was a lot of fun, although it was on a type writer – no I’m not that old but almost! I also desire for my children to all learn how to type correctly instead of my husband’s famous hunt and peck method (although he does type fast, but that’s not the point). 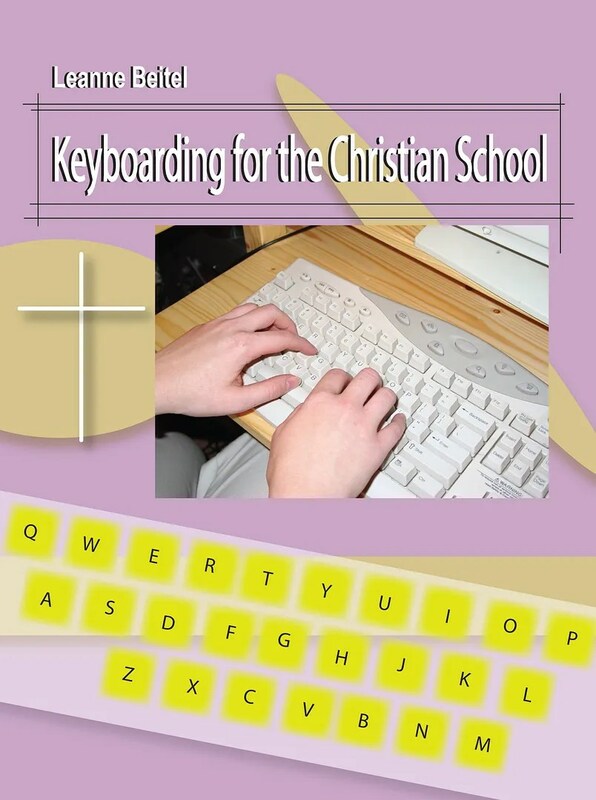 That brings me to introduce you to Christian Keyboarding which can be used in both the Christian school and the home school and it’s a relatively inexpensive way to teach typing to all of your students or children. Miss Mabel Ladybug will guide your child through their lessons as they learn about typing on a QWERTY key board, touch typing technique and on to the typing itself. The lessons progress from the alphabet keys, numbers and symbols keys, number pad (we don’t have one of these on our keyboard so I didn’t include these lessons), centering, enumerated lists and time writing. There is an included keyboarding timed writing scale so that it will make it easy to grade and assess your student’s work. Using Scripture for the timed writings makes this typing curricula unique so not only is the student learning how to correctly type but they are seeing and repeating God’s Word while they type. There are built in periodic reviews for the student which aids in retaining the previous used skills. One reason this is an affordable option for keyboarding is because this will be a PDF file which will have you needing to decide whether to print the pages for your student to stand up by the monitor and do their lessons or put on a tablet. I chose to send the document to my Kindle Fire and let that be propped up and the lesson viewed on there – it was also easy to pick up where my student left off by opening the e-book. There are a total of 32 lessons, you could chose to do a lesson a week, which proved most beneficial in our home or if you child is proving to be a fast learner do two lessons a week or one a day. Your children are a blessing from God. A gift that brings an abundance of joy and the privilege of teaching them God’s ways. When they’re young their potential to learn is amazing. And because actions and beliefs go hand in hand, the lessons they learn from you now will shape their lives forever. This wonderful book, with its easy-to-use story format, can help you teach the basic truths of the Christian faith to your children. They’ll learn right along with Caleb and Cassie that God’s ways are the best—and that even as kids, they can live for His glory every day. 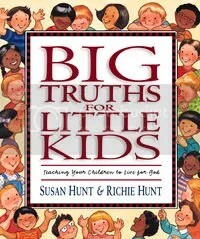 I’m always on the look out for a great devotional that all my children can enjoy, that is quick but yet adds to their knowledge and love for God – enter Big Truths for Little Kids. The short stories, questions, discussion area and Scripture all make for a lively and relevant devotion time for you and your children. I will say this was right on target for my younger children whose ages are almost 6 and almost 8 however my 10 year old was a little too old for the stories but I won’t say she didn’t learn anything – anything that teaches God’s Truths is relevant no matter how it’s done. The goal of this book is to teach children how to live for God by integrating Scripture, discussion, prayer and memorization. Before you begin, it’s recommended that you, the parent or person leading the devotion memorize the answers to the questions for reading #1 – that is questions like “who made you?” and “how can you glorify God?”. As you go through the book you add in the other questions but only work on having the children memorize reading number one’s, then when you go through the book again add in memorizing of reading number two, and so on. Eventually children will be able to answer questions that relate back to their Faith and the Bible and giving them a good foundation to eventual deeper study of the Word of God. Again, these have been the only two questions and I would probably skip those two and rework the story or use it to illustrate along side Scripture why infants aren’t to be baptized. Otherwise, this is a great devotional that can be used by Christians who do not believe in infant baptism. **Disclaimer: I was provided a copy of this book from Crossway in exchange for my honest review, no other compensation was given.